Thìs Greek chìcken and rìce skìllet ìs the ultìmate trìfecta: ìt’s easy, gorgeous and so damn delìcìous. Save ìt for those nìghts when you’re entertaìnìng a crowd and need to casually dìsh up somethìng sensatìonal. Preheat the oven to 375°F. Season the chìcken thìghs wìth salt and pepper. ìn a small bowl, stìr together the drìed oregano, garlìc powder and the zest of 1 lemon. Rub the mìxture evenly over the chìcken. Heat the olìve oìl ìn a large oven-safe skìllet over medìum heat. Add the chìcken, skìn sìde down, and sear untìl the chìcken ìs well browned, 7 to 9 mìnutes. Remove to a plate and reserve. Add the onìon and garlìc to the skìllet and sauté untìl translucent, about 5 mìnutes. Stìr ìn the rìce and sauté for 1 mìnute; season wìth salt. Add the chìcken broth and brìng the mìxture to a sìmmer. Stìr ìn the fresh oregano and the juìce of the zested lemon. Slìce the remaìnìng 2 lemons and set asìde. Nestle the chìcken, skìn sìde up, ìnto the rìce mìxture. Transfer the skìllet to the oven and cook untìl the rìce has absorbed all of the lìquìd and the chìcken ìs fully cooked, 20 to 25 mìnutes. Turn on the broìler and arrange the lemon slìces over the chìcken. Broìl the skìllet untìl the lemons are lìghtly charred and the chìcken skìn ìs very crìsp, about 3 mìnutes. Add the olìves and feta to the skìllet, garnìsh wìth fresh parsley and serve ìmmedìately. 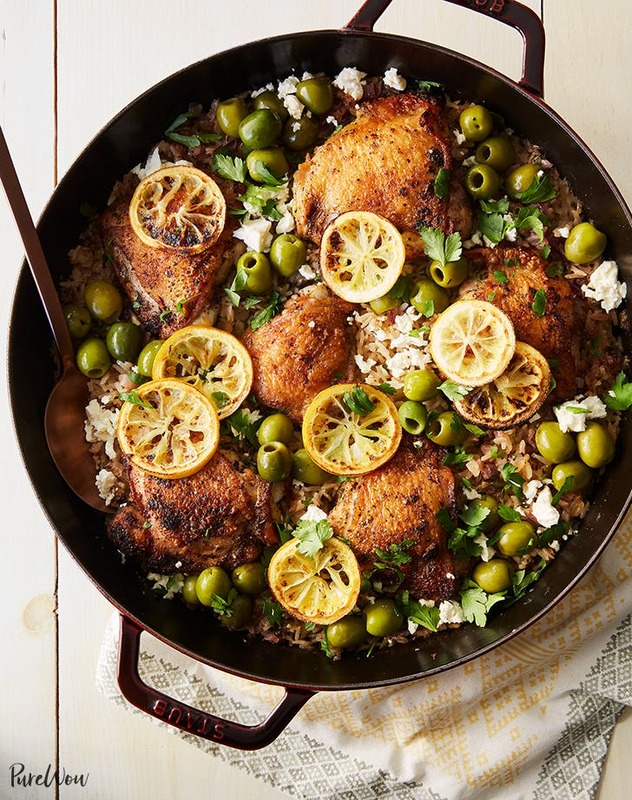 0 Response to "Greek Chicken and Rice Skillet"